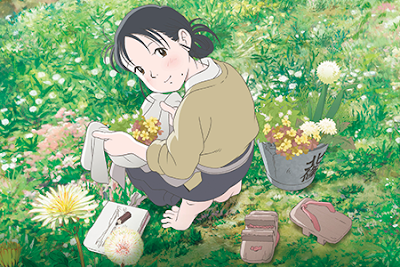 It is not a lie to say that In This Corner Of The World has some of the most shattering sequences I’ve seen. Period. Full Stop. There are two moments in the second half left me feeling as if I had been beaten by a large club. They are something on the order of the crushing effect of Grave of Fireflies. I use the analogy not because both films are animated but because of the power. At the same time In This Corner… never manages to pull it all together to make it a film as great as the moments. The story is of Suzu who we meet as a child in the early 1930’s we watch as she goes to school, paints and draws and has a wonderful life. As time moves on she marries and war comes. The film details life on the home front as the war comes home and eventually her hometown of Hiroshima is leveled. A truly gorgeous film, the film looks like the watercolor painting Suzu paints, the film is clearly of the work of Sunao Katabuchi, whose Mai Mai Miracle was also a thing of beauty. Say what you will of the visual splendor of Studio Ghibli Katabuchi visual style is their equal. This is a film that delights the eye and then some. As a series of sequences the film is amazing. The individual pieces which highlight life in Japan during the war years is great. From an American perspective the film is not the same completely dreary portrait of the war. It is not your typical look at life on the Homefront and it’s portrait does a great deal to restore the notion of there was a life being lived and not being depicted in films, both Japanese and American. There are numerous sequences that stand out with two war ones being among the finest I’ve seen in any film. One concerns the tragedy of an unexploded bomb that left me staring blankly. The other is one in the aftermath of the bombing which broke my heart with its sadness. As great as the sequences are I’m not sure that Katabuchi ever completely ties everything together the way they should be. While we get a sense of the passage of time in some sequences, in others we have to fumble. It doesn’t help that Suze and some characters didn’t seem to change all that much visually. The need to cover a spread of 15 years doesn’t always allow us enough time to connect to the now before moving on. I’m going to guess that the movement through time works better in the source manga where one was not limited by a strict 2 hour run time.